So you're ready to make a purchase from Brooklyn Industries, just click a Brooklyn Industries coupon codes provided here, and copy it. After that, just paste the code into the coupon box during checkout, your discount should appear automatically. With GetDiscountCoupon.com, you'll find only the latest brooklynindustries.com discount coupons. $20 Off Full Price J Shoes: J. Shoes boots, sandals and men's sneakers. Mega Sale at Brooklyn Industries - Up to 70% off Women's, Men's, and Bags. 20% of All Dresses, including Dresses on Sale. Never miss coupons from Brooklyn Industries! Enter your email below and we will send you the latest and greatest Brooklyn Industries deals. Brooklyn Industries Brooklyn Industries “ Designer Clothing and Bags since 1998. Brooklyn Industries offers the ultimate in unique t-shirts, hoodies, bags, Graphic T-Shirts, Dresses, Outerwear and more. Get noticed in cutting-edge designs and limited-edition prints. 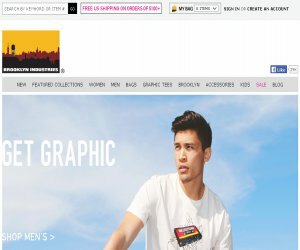 Brooklyn Industries is a cutting edge design company that sells its innovative clothes exclusively through its 14 retail stores and online website. Founded by visionary artists Lexy Funk and her partner in 1998, Brooklyn Industries' stores engage the local community in art, clothing, design and style. Lexy Funk and her partner met at Art Omi in upstate New York where they were both resident artists. After moving to New York City together in 1995, the young successful artists were searching for a way to make a living through their creative endeavors. They decided to start their own company so they could LIVE, WORK, CREATE. In 1996, the duo started Two Tsunami Productions, a design-based company that produced TV commercials and documentary films. Despite some moderate success, Funk and her partner changed course in 1998 when inspiration struck in an unexpected place. Funk's partner had long been staring at the giant billboards from the couple's studio on the West Side Highway. One night, he found a vinyl billboard in a dumpster and decided the material would make a perfect messenger bag. Funk rented an old factory building in Williamsburg, Brooklyn to manufacture their first product “ messenger bags made out of recycled billboards. Currently, Brooklyn Industries has 14 stores. Five are located in Manhattan, five are located in Brooklyn, and the others are located in Chicago, Portland, Oregon, and Philadelphia. The Brooklyn Industries office and design studio are located in DUMBO. Brooklyn Industries continues to grow every year as an innovative and creative vertical retailer that stays true to its Brooklyn roots. Once you have find the available Brooklynindustries.com promo code, choose the best Brooklynindustries.com code according to your needs because you can have multiple promo codes for Brooklynindustries.com. You should check any restrictions and policies before applying coupon, such as expiration date, because some coupons are valid for very short period, So if you need a Latest Brooklynindustries.com Promo Coupon / promotion code please BOOKMARK US (Ctrl + D) and check this site frequently. And one important thing some coupon codes are case-sensitive.